Inhibition of Aurka kinase activity by MLN8237 impairs expression of pluripotency genes in CCE cells as measured by qRT-PCR. All values shown are mean ?SEM for n=3. The level of phosphorylated H3(S10) (p-H3(S10)), an Aurka phosphorylation target site, is decreased in MLN8237-treated samples. Cell Stem Cell 2012 11, 179-94. Alisertib (MLN8237) purchased from Selleck. Recruitment of clathrin to the mitotic spindle is controlled by phosphorylation of TACC3 by Aurora-A kinase. Representative micrographs of HEK293 cells incubated with 0.3 μM MLN8237 for 40 min. Cells were fixed and stained as indicated. EMBO J 2012 30, 906-19. Alisertib (MLN8237) purchased from Selleck. Tissue levels of 53BP1, a-tubulin, IkB-a and IL-6 in an Hs294T xenograft treated with MLN8237 or vehicle control were visualized by immunofluorescence co-staining with DAPI. Representative micrographs are shown from triplicate experiments. EMBO Mol Med 2013 5(1), 149-66. Alisertib (MLN8237) purchased from Selleck. NUSAP mitotic phosphorylation at Ser 240 correlates with Aurora A activity. Protein samples of FLAG-NUSAP immunoprecipitated from I, M and MtMLN or with MtZM were analysed using LC-MS/MS, focusing on the predicted phosphorylated residue Ser 240. The histograms (A, B) show the calculated ratios based on peptides carrying the phosphorylated Ser 240 compared with all matched peptides containing this residue. EMBO reports 2010 11, 977-984. Alisertib (MLN8237) purchased from Selleck. Aurora A inhibition rescues the PPP6C depletion phenotype. (A) HeLa cells transfected for 48 h with control and PPP6C si08 duplexes were treated with 10 or 20 nM MLN8237 or a solvent control for 15 min before lysis in phosphatase inhibitor containing buffer or fixation. Total lysates were analyzed by Western blotting. The red and black lines indicate the hosphorylated and nonphosphorylated forms of Aurora A. Fixed cells were stained using DAPI to detect DNA and antibodies to α-tubulin and Aurora A pT288. The intensity of pT288 staining was integrated using ImageJ over the spindle region defined by TPX2 staining and is plotted in the bar graph ( n = 4). Arrowheads indicate micronuclei. Bar, 5 µm. (B) HeLa cells transfected for 48 h with control and PPP6C si08 duplexes were treated with 10 nM MLN8237 or a solvent control for 24 h before fixation and staining with DAPI to detect DNA. J Cell Biol 2010 191, 1315-32. Alisertib (MLN8237) purchased from Selleck. D) Pharmacological inhibition of AURKA using alisertib led to downregulation of p-EIF4E (S209) and c-MYC proteins in FLO-1 and SK-GT-4 resistant cells, with or without RAD001 treatment. Clin Cancer Res, 2017, 23(14):3756-3768. Alisertib (MLN8237) purchased from Selleck. Mol Cancer 2011 10, 131. Alisertib (MLN8237) purchased from Selleck. Alisertib inhibits AURKA and AURKB in a concentration-dependent manner. (a) Alisertib induces G 2 /M delay or genome reduplication. HeLa cells were exposed to buffer or the indicated concentrations of Alisertib. After 24 h, the cells were harvested and analyzed with ﬂow cytometry. The positions of 2N, 4N and 8N DNA contents are indicated. (b) Alisertib delays mitotic exit or induces slippage. HeLa cells stably expressing histone H2B-GFP were exposed to buffer or the indicated concentrations of Alisertib. Individual cells were then tracked for 24 h with time-lapse microscopy. Each horizontal bar represents one cell (n ¼ 50). Key: light gray ¼ interphase; black ¼ mitosis (from DNA condensation to anaphase or mitotic slippage); dark gray ¼ interphase after mitotic slippage; truncated bars ¼ cell death. (c) Different concentrations of Alisertib are involved in delaying mitotic exit and inducing slippage. Live-cell imaging of cells treated with Alisertib was described in panel (b). The duration of mitosis (mean±90% conﬁdence interval) and the percentage of cells that underwent mitotic slippage during the imaging period was quantiﬁed. (d) Alisertib promotes apoptosis in a concentration-dependent manner. HeLa cells were incubated with the indicated concentrations of Alisertib for 48 h. The cells were then harvested and analyzed with ﬂow cytometry. (e) Concentration-dependent cytotoxicity of Alisertib. HeLa cells were cultured in the presence of the indicated concentrations of Alisertib for 48 h. The number of live and dead cells was analyzed with trypan blue exclusion assay. (f) Concentration-dependent suppression of long-term survival by Alisertib. HeLa cells were seeded on 60-mm culture plates and grown in the presence of 250 n M or 1 m M of Alisertib. After 24 h, the cells were washed gently and propagated in normal medium for another 10–12 days. Colonies were ﬁxed and stained with crystal violet solution (examples of the plates are shown). Average±s.d. from three independent experiments. (g) Both AURKA and AURKB are inhibited by Alisertib.Mitotic HeLa cells were obtained by exposure to nocodazole for 16 h followed by mechanical shake off. The cells were incubated with the indicated concentrations of Alisertib for 2 h. Lysates were then prepared and activated phospho-AURKAThr288 and AURKBThr232were detected with immunoblotting. The asterisk indicates the position of an AURKB-like protein (the same throughout this study). Uniform loading was conﬁrmed by immunoblotting for actin. In this assay, nocodazole and MG132 (a proteasome inhibitor) were added to prevent the cells from exiting mitosis. Accordingly, the total AURKA and AURKB levels remained constant throughout the experiment. (h) Alisertib prevents activation of AURKA and AURKB. HeLa cells were incubated with the indicated concentrations of Alisertib for 8 h. Nocodazole was then added for another 6 h to trap cells that entered mitosis. Lysates were prepared and analyzed with immunoblotting. Actin analysis was included to assess loading and transfer. Oncogene 2014 33, 3550-60. Alisertib (MLN8237) purchased from Selleck. Inhibition of Aurora A (12.5 nM) by MLN8054 or MLN8237 was assessed in duplicate radiometric assays containing 100 μM [γ-32P] ATP and quantified by p81 phosphocellulose assay and scintillation counting. Kinase activity is reported as a percentage of control calculated from duplicate incubations containing 2.5% (v/v) DMSO. IC50 values represent the mean ±SEM calculated from two independent experiments. ACS Chem Biol 2010 5, 563-576. Alisertib (MLN8237) purchased from Selleck. The effects of T217D and T217N Aurora A mutations were directly compared to WT Aurora A-expressing cells. Each well was treated with either DMSO or 500 nM MLN8054 (E), or 30 nM MLN8237 (F) on day one of the experiment and cells were cultured for 8 days, at which point they were fixed. For all colony assays, an area encompassing >90 % of the colonies per dish is shown. Similar results were seen in two independent duplicate experiments. B, drug-treated cells were also stained with DAPI to visualize nuclear DNA and analyzed with a microscope equipped with a fluorescence digital CCD camera. Representative results are shown. Bar, 40 μm. J Biol Chem, 2017, 292(5):1910-1924. Alisertib (MLN8237) purchased from Selleck. C, Fry depletion decreases the level of Thr-210 phosphorylation of Plk1 on spindle poles. HeLa cells transfected with siRNAs were cultured in growth medium for 12 h and in thymidine-containing medium for 36 h. They were then released from thymidine arrest for 12 h before being fixed and stained with anti-Plk1 pT210 ( green) and anti-pericentrin (red) antibodies. DNA was stained with TO-PRO-3 ( blue ). For Aurora A inhibition, after release from thymidine block for 10 h, HeLa cells transfected with control siRNA were incubated for2h in medium containing MLN8237 (100 nM) and MG132 (10 μM). Magnified images of the white boxes are also shown. Scale bar ,5 μm. J Biol Chem 2012 287, 27670-81. Alisertib (MLN8237) purchased from Selleck. First orally available inhibitor of Aurora A.
Aurora A radioactive Flashplate enzyme assay is conducted to determine the nature and degree of MLN8237-mediated inhibition in vitro. Recombinant Aurora A is expressed in Sf9 cells and purified with GST affinity chromatography. The peptide substrate for Aurora A is conjugated with biotin (Biotin-GLRRASLG). Aurora A kinase (5 nM) is assayed in 50 mM Hepes (pH 7.5), 10 mM MgCl2, 5 mM DTT, 0.05% Tween 20, 2 μM peptide substrate, 3.3 μCi/mL [γ-33P]ATP at 2 μM, and increasing concentrations of MLN8237 by using Image FlashPlates. 実験の流れ： Cells are exposed to various concentrations of MLN8237 for 24, 48, and 72 hours. Cells viability is measured using MTT assay, and cell proliferation is measured using 3[H]-thymidine incorporation. For cell cycle analysis, cells are permeabilized by 70% ethanol at -20 °C, and incubated with 50 μg/mL PI and 20 units/mL RNase-A. DNA content is analyzed by flow cytometry using BDFACS-Canto II and FlowJo software. For the detection of apoptosis and senescence, cells are stained with fluorescein isothiocyanate-annexin V and PI. Apoptotic cells are determined by flow cytometric analysis using BDFACS-Canto II and FlowJo software. Manfredi MG, et al. Clin Cancer Res, 2011, 17(24), 7614-7624. Sehdev V, et al. Mol Cancer Ther, 2012, 11(3), 763-774. What is the suggested formulation of this compound for mouse injection(i.p.)? It can be dissolved in 6% DMSO/50% PEG 300/5% Tween 80/ddH2O at 10 mg/ml as a clear solution. 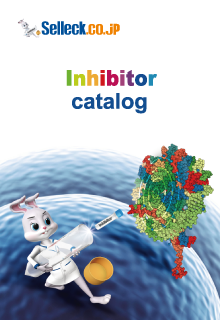 Danusertib (PHA-739358) : Pan-Aurora kinase inhibitor, Aurora A/B/C, IC50=13 nM/79 nM/61 nM. SNS-314 Mesylate : Pan-Aurora kinase inhibitor, Aurora A/B/C, IC50=9 nM/31 nM/3 nM. 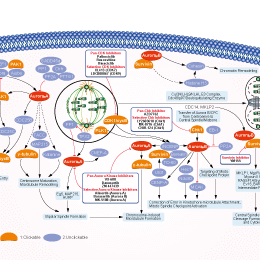 VX-680 (Tozasertib, MK-0457) : Phase II for Advanced Non-Small Cell Lung Cancer (NSCLC).